There’s no point in having a formula – no matter how simple it may seem – if you don’t know how to APPLY it. The beautiful thing about a formula like this – and, why I am so excited every time I get to share it with you – is that you don’t need to know anything about personal finance in order to answer the typical personal finance questions that arise … the formula makes the answers obvious. Let’s take a really simple example, you earn money … so, you’re entitled to spend it right? Well, what you do with your money is your own concern. But, if part of your plans include building wealth, what should you do? 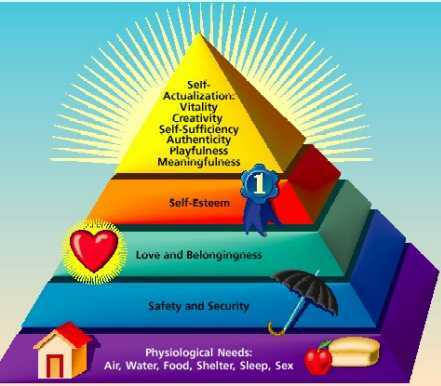 Maslow’s Hierarchy puts physiological needs (food, water, warmth, etc.) right at the bottom, so you had better take care of all of the basic household expenses first. Then comes safety and security so you also had better take care of those brakes! But, then come the ‘soft’ areas that cover the gamut of love and self-esteem, all the way to self-actualization and self-sufficiency. Which means that you have to take care of your future physiological needs etc. – but, that probably accounts for your basic spending and your 401k contributions. Then you have to decide the tough issues: do you have more fun now (spend more now) or hold some back – better yet, invest – so that you can also have some fun later? That’s a personal choice, but one that finding your Life’s Purpose will make much easier. The formula for wealth merely says that (W)ealth is a function of (C)apital and (T)ime. So, you need to start building capital – the earlier the better to also increase time – which means you shouldn’t spend that excess cash on going out and having (too much) fun, nor should you buy depreciating assets such as cars, furniture, and accessories (other than to satisfy the Maslow-needs for basic transport, protection and comfort). And, the formula makes it pretty clear that the more your capital increases over time, the better. So, simply sticking your cash under the mattress probably won’t cut the mustard … you’ll need to start thinking about investments that grow your capital over (sufficient) time e.g. CD’s, bonds, stocks, or real-estate. Nothing earth-shattering, so far. So, next time, let’s use the second part of the formula to answer one of the most commonly-debated questions in personal finance: should you pay off the mortgage on your home loan early, or just let it ride? This entry was posted in net worth and tagged 7million, 7million7years, net worth, wealth by Adrian. Bookmark the permalink. Part One — today’s post — is a great intro that explains the importance of investing, but I’m especially interested in what you’ll say in Part Two: HOW to invest, and specifically, whether to invest or pay off your low-interest debts such as your mortgage. I have my own opinions on this topic, but I’d like to see what you think ….